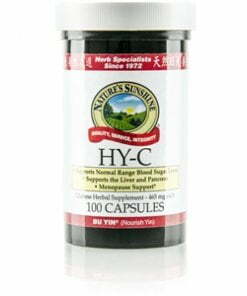 Nature’s Sunshine HY-C, Chinese blends 16 herbs used in traditional Chinese medicine to nourish the glandular system and support metabolic function. Bu yin, the formula’s Chinese name meaning to “supplement yin,” encourages the water element of the body and reduces fire. Water is the element that assists in maintaing normal metabolic processes. HY-C combines dendrobium, glehnia, ophiopogon, and eucommia.